Published by SIBS Forward Payment Solutions, S.A.
MB WAY is the MULTIBANCO solution for money transfers, online payments and money withdrawal. 1. Enroll at MULTIBANCO ATM to connect your bank card with your mobile phone number and create your MB WAY PIN (6 digits). 3. Activate the MB WAY app by inserting the mobile phone number and MB WAY PIN defined at MULTIBANCO ATM. It’s done! Fast and easy. Now your transfers and purchases are all at the same place: your phone. 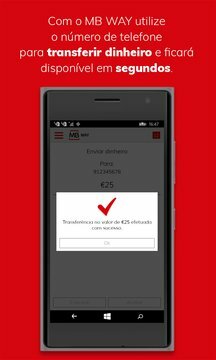 Select the “transferir dinheiro” button at the MB WAY app, insert or select a contact, insert the amount that you want to transfer and confirm the sending with your MB WAY PIN or touch ID. The receiver will get the amount immediately available in his bank account. How to buy with MB WAY? After doing your online shopping, check out by selecting MB WAY to pay. Insert your mobile phone number. You will get a notification on your notification box inside MB WAY app for you to confirm the payment with your MB WAY PIN. After this confirmation, the payment is done. How to buy with MB NET? 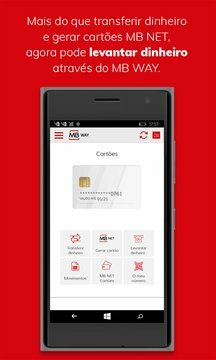 After doing your online shopping, go to your MB WAY app and generate an MB NET Card. After doing that, go to the merchant website and select the pay with credit card option. Insert you MB NET data details (card number, expiry date and 3 security digits). You are actually buying with your real card but without inserting the real card data in the merchant website. How to withdraw Money at MULTIBANCO? Select the “levantar dinheiro” button at the MB WAY app, select or insert the amount that you want to withdraw and confirm with your MB WAY PIN or touch ID. With the generated code, go to the MULTIBANCO ATM, push the green button, insert the code and collect the Money. It is also possible for you to generate a code for someone else to collect the Money at the MULTIBANCO ATM. For that option you need to select the “levantar dinheiro” button, introduce or select the amount and choose the option “Pretende que outra pessoa levante o dinheiro no MULTIBANCO?”. Your contact will receive the code to insert at the MULTIBANCO ATM. For your comfort, if you want so you can get a Receipt of all the operations carried out with MB WAY. Remark: this app is SIBS' unique official app to use MB WAY and MB NET services.